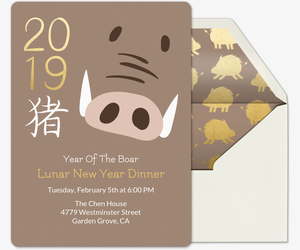 Ring in an auspicious Lunar New Year, no matter which animal is on the calendar, starting with festive red invitations from Evite. 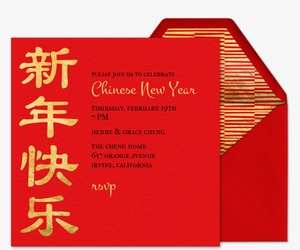 Our free and Premium digital invitations in lucky red and gold can help you round up the relatives to celebrate all 15 days of the spring festival. 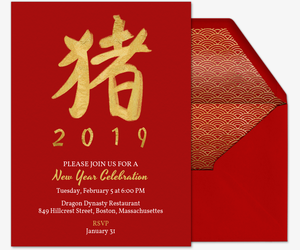 Whether you’re celebrating Chinese New Year, Vietnamese New Year, Korean New Year, or another holiday, there’s no better way to bring fortune, wealth, happiness, and longevity into the new year than by gathering face to face with loved ones. 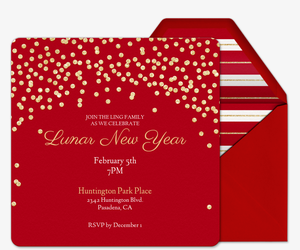 Add a personal touch to your online invitation by featuring a family photo or a design of your own on an Upload Your Own or Design Your Own invitation template. Paperless invitations help you keep everything in place: Track RSVPs, manage your guest list, send messages, make event updates, and post comments all in your invitation -- or on the go via the Evite mobile app for iOS and Android. Every invitation comes with a Private Sharing Feed, so you can easily collect guest photos and use them later for personalized thank you notes. Deciding on a restaurant or other agenda items? Create a poll for guests to vote on activities, or create a What to Bring list. 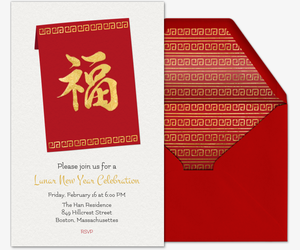 Treat your guests to one of our modern or traditional Premium invitations. The ad-free Evite Premium experience includes matching envelopes for your invitation, custom stamps, and the option to include additional text cards and photos. Pricing is determined by the size of your guest list. For expert party tips, DIYs, recipes, and video tutorials, visit Evite Party Ideas at ideas.evite.com. Learn how to make your own DIY paper fortune cookies or a paper lantern pinata. Plus, don’t forget the gifts! 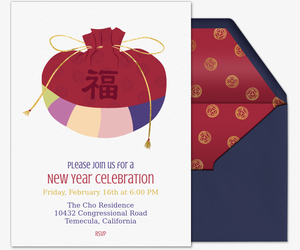 Package symbolic tangerines, oranges, red envelopes and candies to deliver for good fortune. Evite can help make any milestone, special occasion, or everyday event effortless and more memorable. 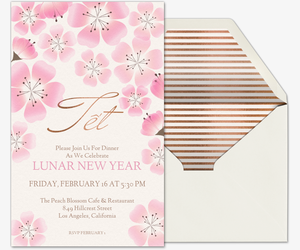 Browse New Year’s Eve invitations, Holiday Party invitations, family gathering invitations, dinner party invitations, birthday invitations, and more.